A built-in 11,500mAh battery allows the PCS5 to charge up to twenty phones to 100% completely independent of a wall outlet. Excellent for universities, airports, and hospitals where outlets are scarce. Customizable signage transforms it into an advertising platform for sponsorships or marketing initiatives. A storage slot holds menus and other marketing materials, while the five interchangeable, retractable charging cables extend out to 12 inches allowing patrons to use their device while it is charging. 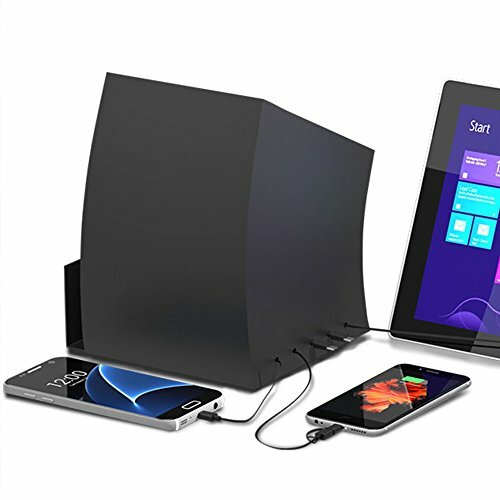 ULTIMATE CHARGING STATION - A universal charging station all in one. Thousands sold and used worldwide by more businesses, schools, airports, venues, and events than any other brand! UNIVERSAL COMPATIBILITY - Included with the charging station is: 5 (five) Micro USB Cables and 2 (two) Apple Lightning Adapters. Retractable up to 1.25 feet! If you have any questions about this product by ChargeTech, contact us by completing and submitting the form below. If you are looking for a specif part number, please include it with your message.